Lately there has been some confusion about what I do. PAUL HAWORTH and SANDRA KASSENAAR had a bet about my profession. While Paul thought I was a graphic designer – I work for that department at the Rietveld Academy – Sandra was convinced I was a curator. 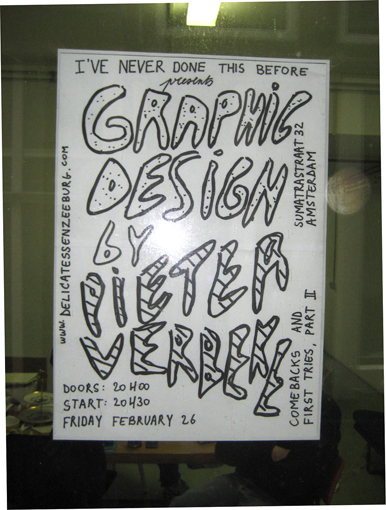 I contributed to Paul's THINGS I'VE NEVER DONE BEFORE events in DELICATESSEN, Amsterdam by making a poster announcing the evening. Although it wasn't all easy (Puberal typefaces was all I could draw and for a while even bodypainting seemed a good plan) I did do it. So, Sandra, you lost, wich means you owe Paul a copy of FANTASTIC MAN.